I love pink. Last season's fashion affair with all things baby pink really hasn't helped. All things in moderation and all, but a flash of pink is just dandy with me. I turn 23 a week today. I'm one of those people who gets far too excited about their birthday, so you're all just going to have to go along with the excitement until the celebrating is over. 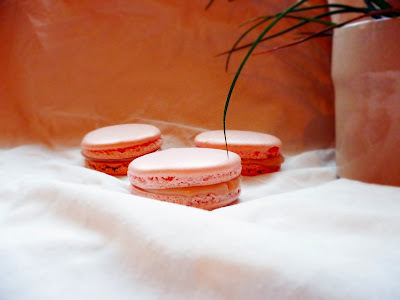 One way I'm planning on celebrating is to make a very pink cake: pink Swiss icing; white fluffy sponge; and to top it off, pink macarons. I wouldn't class it as a birthday cake as such, just a cake for me to celebrate with. I feel like a bad villain in that I'm telling you my grand plans, and that now they'll inevitably fail, but I just wanted you to know that I have bigger plans for these macarons. They are just the start! Preheat the oven to 145C/130C fan. Line several baking trays with parchment paper or macaron moulds. If using parchment paper, use a shot glass or similar to draw circles on it as a piping guide, separating by about 1in. Pipe the macarons onto the side you didn't draw on (in theory the rings should still be visible). Sift the icing sugar and ground almonds into a bowl and place to one side. Place the egg whites and caster sugar in a mixing bowl and whisk on high for 6 minutes. Add the vanilla extract and as much food colouring as desired, then whisk for a further 2 minutes. The meringue should be so stiff that it stands upright on the whisk when you invert it and gets stuck inside the 'cage' of the whisk. Tip the icing sugar and ground almonds into the meringue. Fold it in, but as you fold it push down on the meringue as if you are trying to push the air out of it. Keep doing this, making sure you do this to the entire mixture, until a drop of the mixture disappears into the rest of the mixture after about 20 seconds. Pipe the macaron mixture onto the baking parchment. Pick up a baking tray and slam it down onto the worktop, then turn the tray 90 degrees and repeat. This helps any air bubbles in the mixture rise to the top. Repeat with your other trays of macaron mix. Bake for 25-30 mins, or until the macaron peels off the parchment without leaving behind any bits. Leave to cool on a wire rack. Make the white chocolate ganache by melting the chocolate, then stirring in the water once it has cooled slightly. Leave the mixture to cool, then use a teaspoon of it to sandwich two macaron pieces together. If you need any extra help with macaron making, Stella at Bravetart is your girl. This month's Treat Petite challenge, hosted by Kat at The Baking Explorer but co-founded by Cakeyboi is 'Free From'. Macarons are so light as air because they are free from flour, so I feel they fit into the challenge. Wow, you make this sounds so easy. Maybe I can do this...Happy early Bday! And, I start my bday celebrations well in advance and seem to eek it out even a month after. More like a birthday season, really. No worries, celebrate on! Enjoy! These are so pretty! Thanks for entering into Treat Petite! Thanks! They can be a bit temperamental but they are totally worth trying. Happy Birthday and what lovely perfect macarons you've made to celebrate. Someone recommended to me to use powdered colouring to get a really vibrant finish and it does make all the difference. You only need a tiny bit too. Enjoy your celebrations. Ooh thanks for the tip! Had a great birthday, thanks for the wishes.